It happens from time to time that, as with people, the first impression one has of a book changes when one expends some energy, and looks more closely. I remember a girl who glowed like the sun to my heart when light shone through her hair. But I will spare you those details. I was struck with a similar sort of smitten on my first reading of Simon Van Booy’s The Illusion of Separateness, my reaction a Some Enchanted Evening experience. Wow, what a great book. Moving, poetic, artfully constructed. Curves in all the right places. Oh, sorry, yeah, the book. While I may move from point A to some other point over the course of this pondering, I should let you know up front that I end up still liking the book, so there will be no trash-talking, Dear John letters, or years of pain and regret here. Oh, damn, yeah, the book. Remember the Oscar winning film Crash? Yeah, I think Brokeback should have won too, but the structure was one of separate tales intersecting. Ditto here, with the added element of time, like three-dimensional (or would that be four-dimensional?) chess. There are two primary players. That would be Hugo. His is the main story here. When we meet Hugo in 1981 he is a middle-aged maintenance man at the Manchester Royal Infirmary. He is asked by a Nigerian immigrant neighbor to watch her seven-year-old son, Danny, and this could be the beginning of a beautiful friendship. (We do follow Danny a bit later) Hugo does not really have friends. A sizeable chunk of his head was blown away during World War II in Paris, and people tend to keep their distance. He grows tomatoes to give away, and seems a decent sort. But he has very troubled dreams, or are they memories? There are others. John is a US bomber pilot in WW II who crashes in France. Amelia is a blind grand-daughter we meet later. The core connection here is between Martin and Hugo. There are other goings on, but their impact, IMHO, is either barely related or serves to manipulate events to a foregone conclusion. Still, the first time I read this book I was all choked up at the end. Hanky-worthy it was. And I will not try to take that away. This is a very, very moving story. You will feel, for sure. I will get to my concerns in a bit. But first some internals. The story connects from character to character like a back-stitch. When one chapter ends, the last bit connects to the following chapter and a different character. And so on. There are plenty of parallels working here. Some characters feel hated, Hugo in different times for different reasons, Danny as a black child in Manchester. Memory and imagination get a lot of attention. Kindness is on display in diverse locales, as some who have feed those who do not. Artistry pops up multiple times too. John draws, as does Danny. Amelia works at an art museum. A briefly noted schoolboy in France also draws. Both Hugo and Martin work as maintenance men. Memory and imagination figure in this story as well, as does a contemplation of the eternal. Van Booy has a gift for language and it is no shock to learn that he publishes poetry as well. So there is plenty here to hang your feeling of content on. It is not only a story, but one that carries some greater weight. It also has its very own tone and cadence. One might associate clipped sentence structure with a writer like, say, Cormac McCarthy. Which carries certain dark implications. But that clippedness is used to very different purpose here. Sometimes a priest would come and sit with me, talk to me, touch my hand. It felt nice. I wondered if His hand touches all, or if ours touch His. I remembered then, books in an attic. A small hand. Forbidden but they crawled through boxes anyway. Boxes of books and other boxes. Then I thought of the boy who brings cakes to the park for us. I wanted to boast to the priest. I felt proud to know someone like that, he knows Him, but I know Someone too. A child with the power to save us. What people think are their lives are merely its conditions. The truth is closer than thought and lies buried in what we already know. So what’s the gripe? 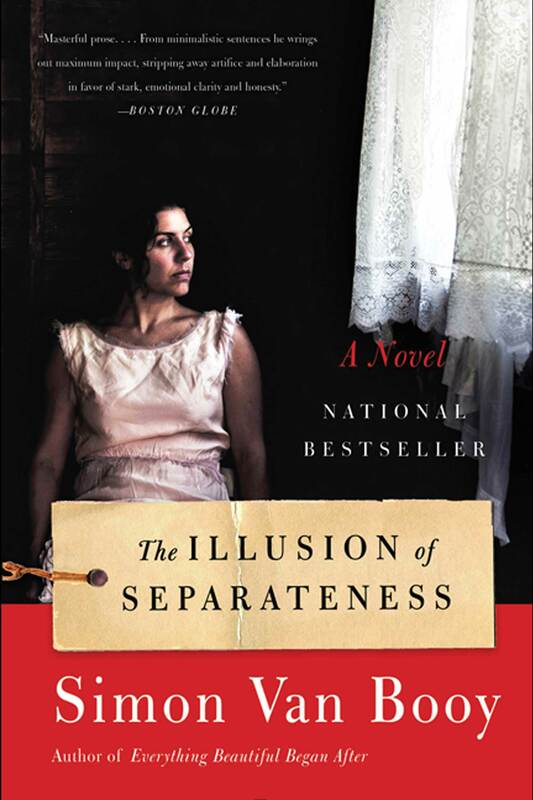 The title of the book is The Illusion of Separateness and we are meant to see that we are all connected somehow. Six degrees or something. Which is fine. I am sure there are many ways in which the paths of our lives cross each others. Sometimes in meaningful ways, most times not. The gyrations Van Booy went through to link Martin and Hugo seemed to me, on my second reading, forced. Not their first encounter, but latter ones. As with some Spielberg films, you get the sense that the writer/director is leading you by the nose and maybe pulling too hard sometimes on the reins. It felt less like something was being revealed than that something was being constructed. And sometimes it did seem a bit on the goopy side. I know, I know, makes it sound bad. And I do not really mean for the overall take to be a huge negative. We are manipulated by writers all the time. It is part of their job. But sometimes the beams are not well enough hidden behind dry wall or plaster. So, bottom line is that if you can suspend your disbelief for a short time (I really do mean a short time. This is a short book, and a very fast read.) you will be well-rewarded by an amazing and incredibly moving story, told in beautiful language. Not so, with the girl. We did get together, but it ended badly, very badly. This book, however, will cause you no harm at all. Who knows? Maybe you will feel a connection and it really will be The One for you and not an illusion at all.